Why is Testing Early and Testing Frequently a business critical strategy? 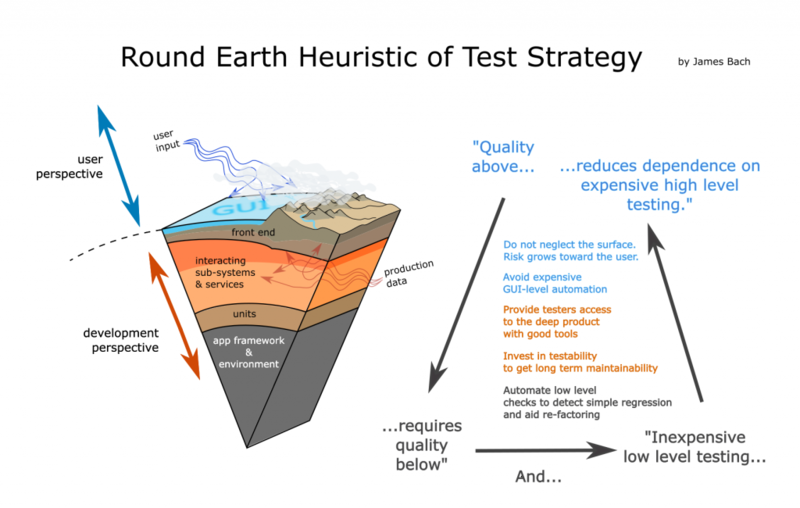 use this geophysical analogy to explain more intuitively why a good tooling strategy can access and test the product on a subterranean level, though not necessarily at a level below that of the platforms we rely upon. Good analogies afford deep reasoning. The original pyramid (really a triangle) was a context-free geometric analogy. It was essentially saying: “Just as a triangle has more area in its lower part than its upper part, so you should make more automated tests on lower levels than higher levels.” This is not an argument; this is not reasoning. Nothing in the nature of a triangle tells us how it relates to technology problems. It’s simply a shape that matches an assertion that the authors wanted to make. It’s semiotics with weak semantics. It is not wrong to use semantically arbitrary shapes to communicate, of course (the shapes of a “W” and an “M” are opposites, in a sense, and yet nobody cares that what they represent are not opposites). But at best, it’s a weak form of communication. A stronger form is to use shapes that afford useful reasoning about the subject at hand. When I tell people about the Round Earth model they often start speaking of caves, sinkholes, landslides, and making jokes about volcanoes and how their company must live over a “hot spot” on that Round Earth. These aren’t just jokes, they are evidence that the analogy is helpful, and relates to real issues in technology. Note: If you want to consider what factors make for a good analogy, Michael Bolton wrote a nice essay about that (Note: he calls it metaphor, but I think he’s referring to analogies). The Round Earth model shows testing problems at multiple levels. The original pyramid has unit testing at the bottom. At the bottom of the Round Earth model is the application framework, operating environment, and development environment– in other words, the Platform-That-You-Don’t-Test. Maybe someone else tests it, maybe they don’t. But you don’t know and probably don’t even think about it. I once wrote Assembler code to make video games in 16,384 bytes of memory. I needed to manage every byte of memory. Those days are long gone. Now I write Perl code and I hardly think about memory. Magic elves do that work, for all I know. Practically speaking, all development rests on a “bedrock” of assumptions. These assumptions are usually safe, but sometimes, just as hot lava or radon gas or toxified groundwater breaks through bedrock, we can also find that lower levels of technology undermine our designs. We must be aware of that general risk, but we probably won’t test our platforms outright. While geophysics can be catastrophic, it can also be more tranquil than a stormy surface world. Unit level checking generally allows for complete control over inputs, and there usually aren’t many inputs to worry about. Stepping up to a higher level– interacting sub-systems– still means testing via a controlled API, or command-line, rather than a graphical interface designed for creatures with hands and eyes and hand-eye coordination. This is a level where tools shine. I think of my test tools as submarines gliding underneath the storm and foam, because I avoid using tools that work through a GUI. The Round Earth model reminds us about data. Data shows up in this model, metaphorically, as the flow of energy. Energy flows on the surface (sunlight, wind and water) and also under the surface (ground water, magma, earthquakes). Data is important. When we test, we must deal with data that exists in databases and on the other side of micro-services, somewhere out in the cloud. There is data built into the code, itself. So, data is not merely what users type in or how they click. I find that unit-level and sub-system-level testing often neglects the data dimension, so I feature it prominently in the Round Earth concept. The Round Earth model reminds us about testability. Complex products can be designed with testing in mind. A testable product is, among other things, one that can be decomposed (taken apart and tested in pieces), and that is observable and controllable in its behaviors. This usually involves giving testers access to the deeper parts of the product via command-line interfaces (or some sort of API) and comprehensive logging. Quality above requires quality below. Quality above reduces dependence on expensive high-level testing. Inexpensive low-level testing reduces dependence on expensive high-level testing. Risk grows toward the user. Performance is key for every business and every application. It’s a factor that needs to mature with time and technology upgrade. Automation helps to further speed up and secure the testing process not just by ensuring velocity, but also by validating quality at every stage. It helps to plug in continuous integration within the system, with a robust automation suite to maximize test coverage and ensure quality. When automation is plugged within performance testing, it helps to materialize the idea of testing early and through frequent cycles. Thus, bringing in added agility to the testing and development course. Cybersecurity threats are growing each day, and practically, each phase of digital proliferation brings forth a new threat. It is absolutely critical to identify these threats during the initial phase of application development. This not only helps to cut down the time and efforts, but also ensures that your business application is robust and ready for the fluctuating user environments. The digital space is infested with viruses, cyber risks, and all kinds of security attacks. This makes automation of these tests critical, with focus on conducting these tests way ahead in the testing cycle. This point makes sense in an Agile scenario, where the teams are smaller and each person is responsible for everything that happens around. In an Early testing scenario, it is important to share the responsibilities effectively to speed up the testing and development activities. Efficiency cannot be achieved in isolation, which makes team strength absolutely critical. This can be made possible by ensuring transparency and opening up diverse channels of communication across the teams. It also implies that testers must collaborate with developers and take on their responsibilities, or shift responsibilities as well. Partnering with developers can be a mutually beneficial scenario, as it will help to bring down the differences and encourage collaboration amongst teams to keep up the speed. While building the application could be a one-time process, but it is important to keep the code upgraded and relevant for the users. The code needs to change rapidly and not necessarily the code that you test might end up into production. At the same time, it is critical to keep testing the code for its validity and usefulness. Early and frequent testing cycle enables teams to keep the code upgraded and up to the task. Continuous nature of this activity helps teams to keep testing complicated algorithms, twisted codes, and even critical functions. When testing is done constantly, it helps to boost the chances of exploring new and innovative ideas. When teams tend to find glitches or gaps at an early stage, it encourages them to find new ways to achieve similar results. In this way, new ideas and concepts evolve with time and testing. In the current digital transformation scenario, development teams and organizations at large need this kind of support. It helps them to stay innovative and competent in a challenging market scenario. Business enterprises across the world are experiencing a common trend of increased client expectations, technology upgrades and unpredictability in their business environment. The magnitude of these changes and accompanying uncertainty is compelling most of the enterprises to adopt “Agile” – a flexible and progressive software development process/model.